Here is a list of volunteer service project opportunities in our community which are available throughout the year. Below here is a list of ideas. Complete this form to learn what is the right ministry for you. Stephen Ministry is a Christian confidential ministry. Stephen Ministers are lay members of our Parish who are specially trained to listen and stand with another going through a challenging time. Become a Stephen Minister! Providing distinctively Christian confidential care. Application is here. Assist at Emergency Food Program administered by Catholic Social Services at Northside Community Center, Ann Arbor, which distributes groceries and personal care items to low-income families and individuals on a monthly and/or emergency basis. Serve a Meal for the Hungry: Prepare and serve a meal at the Ann Arbor Community Kitchen. Food Gathers Food Rescue/Food Bank program – help fight hunger in our community. Learn more and sign-up for those additional opportunities at Food Gatherers foodgatherers.org (734-761-2796). Thanksgiving Dinner Free provided at The Original Cottage Inn Restaurant, 512 William Street, Ann Arbor, open to the needy & homeless from 10:30AM – 2PM on on Thursday, Thanksgiving day. Volunteers are offered two work shifts. Volunteers call 734-663-3379. (They start accepting volunteers October 15). See other free meal contacts here. Hope Medical Clinic, Inc, Hope Center, 518 Harriet St., Ypsilanti, MI 48197; 734-484-2989. Salvation Army & Ypsilanti Free Methodist Church, 1800 Packard Road, Ypsilanti; (734)482-2055. 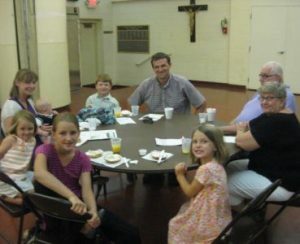 St. John the Baptist Catholic Church, 411 Florence St., Ypsilanti, MI 48197; (734) 483-3360. SOS Community Services, 114 N. River St., Ypsilanti, MI; (734) 484-9945. Bethseda Bible Church, 1800 S. Huron St., Ypsilanti, MI; (734) 483-7279. Ann Arbor Vineyard Homeless Ministry, 2275 Platt Rd., Ann Arbor, MI 48104; (734) 477 -9135. Shelter for Homeless Families at Alpha House, 4290 Jackson Rd., Ann Arbor 48103. For a week (end of May and mid October), join our St. Francis team in providing hospitality for 5-8 homeless families staying at Alpha House Shelter in Ann Arbor. This is an opportunity for individuals and families with kids to serve together! Shelter at St. Francis Gym for the Shelter Association of Washtenaw County. Sign-up to help during the seven (7) days with hosting approximately 25 homeless men from our community. Drivers are needed to transport men from the Delonis Center Shelter, Ann Arbor, to St. Francis Gym, and, then for breakfast, to St. Andrew Episcopal, Ann Arbor. Overnight hosts and other volunteers are needed to make coffee & oversee the hospitality efforts, or, to provide snacks and set-up and serve. Contact the Parish Office, (734-821-2121) (734-480-8422) justice@stfrancisa2.org . We assist with filing Tax forms. For 12 weeks each year (beginning of February to April), parishioners volunteer their time to assist individuals in need on their Income Tax Return if they have limited income and simple tax returns. Sign-up here. Or, learn more here. Need Help With Your Tax Return? Call the Parish Office at 734-769-2550 to make a 45-minute appointment Saturdays, February through April. No walk-ins! St. Francis – Donate a Day – a Saturday in April each year, yard work & window washing at: Emmanuel House. Teens are welcome with their parents. Please use our Volunteer Sign-up Form. Questions? Contact: the St. Francis Parish Social Ministry Office, (734-821-2121) justice@stfrancisa2.org. Jesus is in JAIL! Will you pray with Him? “Be Not Afraid!” Jesus was incarcerated during his life, and he can still be found in the jail. Come and see for yourself. Join a jail ministry team! To get started you must attend an orientation on “The Rules & Regulations of the Jail” presented by the Jail staff at the Jail. Orientations are scheduled three times a year (February, July, and October). Call the St. Francis Parish Office at 734-821-2121. Learn more … volunteer orientation … schedule of services. 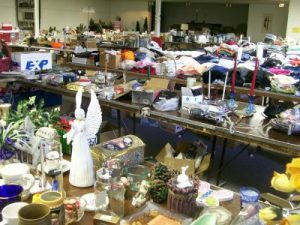 St. Francis Parish Annual Rummage Sale happens for three days every June in School Gym hosted by St. Francis Altar Society. During that week in June Drop off your donations, clean and in good repair, at the School Gym. program Neighborhood Senior Services (734-712-7259) serve seniors in Washtenaw County who are living independently and need services and support to remain at home with comfort, safety, and dignity. Volunteer opportunities include Medical Access Drivers, Senior Companions, and Food Delivery Volunteers. Also an Annual Fall Chore Day for volunteers to help their neighbors by raking leaves, checking smoke alarms—enabling seniors to enjoy the independence of living in their own homes with dignity. Groups, individuals and families are welcome. Register by calling 734-712-7259. 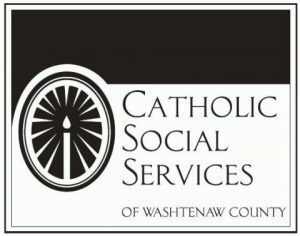 Catholic Social Services of Washtenaw County has volunteer opportunities in the following programs. 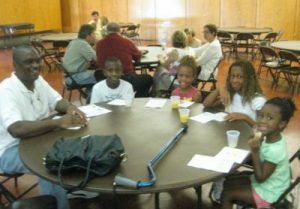 “The Oaks” Adult Day Services Program needs both individuals and groups (including children) for a variety of activities. Volunteer Respite Program volunteers provide respite to caregivers by staying with the family member while the caregiver takes a break. Tax Assistance Program volunteers help lower-income older adults prepare and file Michigan Homestead Property Tax Credit and Home Heating Credit claims. Medicare/Medicaid Assistance Program volunteer counselors meet with individuals needing assistance with any aspect of health insurance. Emergency Food Program needs volunteers to help unload donations, stock shelves, help clients shop, carry food to cars, and do client intakes. Shelter Association of Washtenaw – Volunteers first attend an orientation of 1½ hours required, and, generally held monthly. To sign up for orientation, at www.annarborshelter.org and see the Volunteering tab. For more information contact Volunteer Coordinator at 734-662-2829. His Eye is on the Sparrow — independent homes for adults with disabilities. For more information contact the St. Francis Parish Outreach Ministry Office at justice@stfrancisa2.org or 734-821-2121.